The University of Maryland (UMD) and its partners will utilize UMD's expertise in additive manufacturing (3D printing) and thermal engineering to develop novel, polymer-based, air-cooled heat exchangers for use in indirect dry-cooling systems. 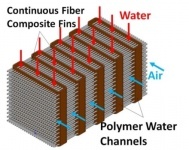 The innovation leverages UMD's proprietary, cross media heat exchanger concept in which a low-cost, high-conductivity medium, such as aluminum, is encapsulated as a fiber in a polymeric material to facilitate more effective heat dissipation. To realize the innovative heat exchanger design, the team will develop an advanced, multi-head, composite 3D printer. The heat exchanger modules will be arranged in uniform rows with large spacing between the rows, which optimizes heat transfer while allowing for easier cleaning and maintenance. In addition to the system's advanced cooling capacities, the heat exchangers will also be low-cost, low-weight, and resistant to corrosion. Ideally, UMD's technology will be used in conjunction with a direct contact steam condenser in order to provide power plant cooling with performance comparable to evaporative, or wet-cooling, systems. UMD estimates that additive manufacturing could enable transformational heat exchanger designs with high performance at low cost, including the potential for onsite manufacturing of the heat exchanger, which could save additional transportation and installation costs. If successful, UMD and its partners' innovative heat exchanger design will lower the cost of air-cooled systems without reducing the efficiency of power plant cooling. Enhanced air-cooled heat exchangers could help power plants maintain energy efficiency when the use of water for cooling is restricted. UMD's design is resistant to corrosion and requires little maintenance, furthering the lifetime of the system and reducing the need for replacements. Moreover, printing of the heat exchangers on site could eliminate transportation of the heat exchangers, thus reducing carbon footprint. By utilizing affordable materials and additive manufacturing, the system could be a low-cost way to cool power plant condenser water.